Information: Five more postcards from the Tatsunoko Time Capsule postcard line. The cards were packaged in a resealable plastic bag. 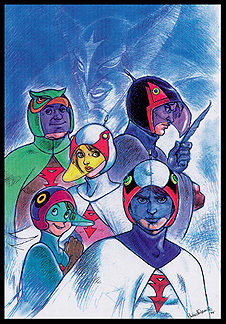 The image pictured above was only "Gatchaman" card included with this set. It was illustrated by Sadao Miyamoto. This postcard was also released in a special metallic ink version which was offered only as a promotional item. To see it, click here.